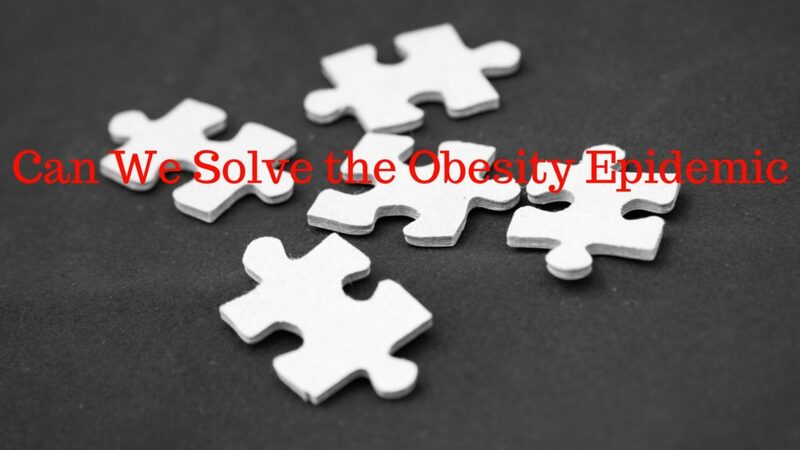 Can We Solve the Obesity Epidemic? Obesity is a hot topic in the health and wellness arena. In my recent research for a class discussion, I found 100,000+ peer reviewed articles written on the subject just in the past decade. It’s a well known fact obesity has become a significant crisis in the United States. Take a quick look below at the growth of obesity rates in the past twenty years. From less than 20% to approximately 36% of the nation is obese!! Let’s not forget the children, our future. The most current stats show 1 in 5 of children ages 6 to 19 yrs is obese! I find it disheartening to see kids who are overweight because they are at a higher risk for chronic diseases.1 However, while it still remains a major issue, there is positive progress. In the past several years, the percentage of children affected decreased. Please help in continuing the decreasing trend! Educate yourself and your community to help our children thrive! The first part of the question was easy enough to answer because of the thousands of research articles available to point as to what caused our nation to to be almost 36.5% obese.2 You can probably take a guess as well without having to look at the supporting evidence. But before I present to you the two glaring reasons why we’re in this state of epidemic, let’s define the term OBESITY. Obesity is defined as the measure of excessive body fat considered healthy relative to the height of the individual. However since body fat is not simple to measure and can be costly, the next best measurement is the Body Mass Index or BMI. BMI is 30 or greater for a person to be considered obese. Why is there an Obesity Epidemic? Among American adults, 80 percent do not meet the government’s physical activity recommendations for aerobic and muscle strengthening and 60 percent are not sufficiently active to achieve health benefits. How to Reverse this Crisis? Coming up with an original idea was more complicated to answer. A number of programs are already instituted to combat this epidemic. However, obesity remains high in the U.S. We still have more work to do. You know how every box of cigarette requires a warning label? SURGEON GENERAL’S WARNING: Smoking Causes Lung Cancer, Heart Disease, Emphysema, And May Complicate Pregnancy. Quitting Smoking Now Greatly Reduces Serious Risks to Your Health. Smoking By Pregnant Women May Result in Fetal Injury, Premature Birth, And Low Birth Weight.Cigarette Smoke Contains Carbon Monoxide. As an experiment, how about including a Warning Label for Beverages containing High Amounts of Sugar? I think the presence of a warning label increases AWARENESS and would make a person think twice about purchasing the beverage. When you’re aware of the consequence of your action, you can make an intelligent decision whether or not you want to accept the consequence. My current Whole 30 experience has instilled in me the habit of checking ingredient labels. It’s comforting to know what I’m putting in my body is helping not hurting it. Start a television advertisement campaign to promote movement so instead of watching ads about McDonald’s bringing back the McRib, it would be an ad with a person encouraging you to stand up and perform a few exercises during the break. Would the same psychology work if there were more ads focused on taking a movement break in between shows? Imagine your favorite actor or actress instructing you to get up and dance! Will this persuade you to get up off the couch and try it? Would it then spark up your motivation to do more? On a more personal level, I think it would help to be a part of a community who have the same ultimate goals which is to get healthy. 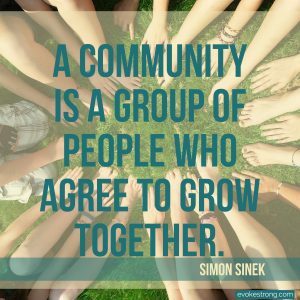 Evoke Healthy Habits is a community for women to receive support and guidance from one another while going on a journey of change towards a lifestyle of healthy habits. We have weekly challenges, recipes, workouts, and tips to help you establish healthy habits for the year! Is Axiom from Wall-E our Future? 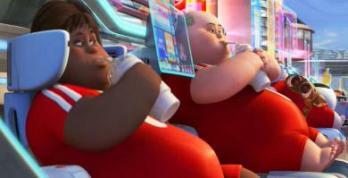 I can’t help but think about the fictional obese characters in Wall-E. The ones where they are in an automated setting staring at screens and sipping shakes. Moreover, they are sitting in hovercrafts transporting them from one place to another without ever having the need to get up. Is this where our world is heading? It’s why this epidemic is such a hot topic. Many are invested in determining how best to solve it. I think overall the mindset of our nation has to shift to truly investing in our health for our future to remain intact. I would love to hear your thoughts! Any original ideas on how to reverse the obesity epidemic? 4 Clark, M.A., Lucett, S.C., McGill, E., Montel, I., Sutton, B. (Eds.). (2018). NASM essentials of personal fitness training. Burlington, MA: Jones & Bartlett Learning. 5 Sonestedt, E., Cecilie Øverby, N., Laaksonen, D. E., & Eva Birgisdottir, B. (2012). Does high sugar consumption exacerbate cardiometabolic risk factors and increase the risk of type 2 diabetes and cardiovascular disease?. Food & Nutrition Research, 561-19. 7 Knox-Kazimierczuk, F., & Shockly-Smith, M. (2017). African American Women and the Obesity Epidemic: A Systematic Review. Journal Of Pan African Studies, 10(1), 76-110. Next postHow to turn your I CAN’Ts to I CAN! I think it’s definitely a complicated topic and it will take a mix of different things to help combat the issue. I think education is so important. Sometimes there are foods that we think are healthy, but when doing more research, we find out that they arent! I agree with education especially with knowing how to read ingredient labels. I deal with this on a daily basis in my job as a pediatric nurse practitioner. The problem is really 2-fold; sedentary lifestyle aka screen time and our food industry. They don’t have these issues in other countries. I bet! I’m curious are the parents concerned about their kid’s health and seek guidance? It certainly blows my mind when I see statistics like this! I do think it’s great that we are seeing improved nutrition labels now we just need people to read them! Yes they are coming out with the added sugar labeling this year. I agree with the sedentary life being a huge issue, but also the availability of fast food is sickening. Not only is it priced super cheap (so everyone can afford it, especially kids), but most portions are are HUGE. I’m always amazed at how long the drive-up lines are…their target customer doesn’t want to get out of the car and walk a few steps for the food. It’s crazy how the fast food industry is making a profit to the detriment of the population’s overall health. I understand it is up to the individual to buy fast food but wish more fast healthy and cheaper alternatives are available. The statistics are sobering, aren’t they?! There are clearly no easy answers and it will probably take a combination of tactics to see progress. Education is a huge component, but I also think economics plays a big part. Packaged foods and fast foods are plentiful and relatively cheaper than healthy alternatives. For people on fixed incomes or tight budgets, cheap may trump healthy. I agree I read a study as to how finances can definitely influence a person’s decision whether to eat healthy or not. I see the effects of obesity every day in my career as a nurse. We need to get this under control as a nation for sure. I’m curious to know how much guidance they receive when someone obese goes to a doctor’s check up. Sadly, I think the food, beverage and sugar industries have too much sway to ever get rules promoting that we consume less. I was surprised to hear that some farmers objected to the Meatless Monday movement because it undermined their meat sales. True it’s all about the $ – even when we know what’s bad for us, we still go for it. I also find it to be a complicated issue, with no easy solution. There’s a huge socioeconomic facet at play, and really, the best we can do is eat well and be active, and share that with others. I like how you put it with settings the example and be the leader for many to follow. So many facets to this issue and I do think the Wall-E reference is a realistic prediction of how we might end up as a society. But I’m hopeful that with more and more knowledge we’ll be able to curtail this trend! I feel there is a movement towards more health promotion because of the issues arising with the obesity epidemic and chronic conditions so I’m hopeful we will be able to reverse it. This is exactly why I have a day job – inactive people! My day job is about getting people more active to reduce inactivity, sedentary behaviours etc. We need more of you to get people to move more! Yes I live in the south and obesity is definitely an issue. Southern food is not always the healthiest. We have too many bad options and fast food options in this country for sure. 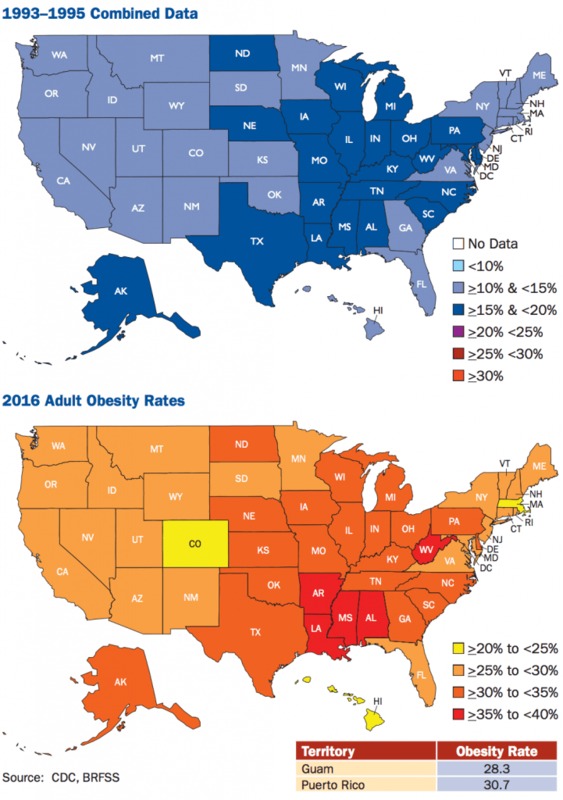 I think I read in the Obesity study that the higher percentages of obesity are concentrated in the south and mid-west. This is a great post! As a nurse, I deal with the complications from obesity on a daily basis!! Thanks Angela – are your patients willing to make a change to improve their condition? Oh, goodness. This is such an intense topic!! Honestly, I think the only thing that will fix it is education! I say this because when I went through my own transformation I didn’t know or understand all the “bad” things I’d been putting into my body for years. Additionally, as a teacher, I’ve been in totally different environments and seen how kids think about food. In the low income schools I’ve been in, there’s a much higher rate of obese children (and parents too:( ). I’m currently in a private school where every child is educated on their food choices and why they’re making them. I see fruits and vegetables for snack instead of sodas and chips. I know so much of their education started at home. It’s very true how kids need to be more educated about food choices and hopefully they’ll be able to talk to their parents about what they learned too. It is up to the parents to decide what goes in their kids snack and lunch bags. There are so many complications from obesity that many people don’t even think of. As a teacher, it is incredibly difficult for me to see overweight children walk into my classroom. So many of their poor habits stem from their parents’ example and/or choices, and it breaks my heart to see the path that their child is going down. It is true – as a Mom I know my kids want me to give them guidance. It’s out of their control what types of food they eat. I live in the Netherlands and while we do have Obesity here (and it’s definitely more than it used to be 25 years ago it’s still less than in the US. And I’ll tell you why (in my opinion): More movement – everyone pretty much bicycles here and the infrastructure is set up for cycling so that there are WAY less car-bike road accidents than in countries without the infrastructure. Also, WAY less convenience foods and restaurants. The choice in the US is insane! Fast food, convenience foods, there is something for everyone and it makes it easier to order in or get something quick than to buy fresh ingredients and cook at home. Hi Renee, thanks for sharing your perspective. It’s interesting to hear what the lifestyle is like in other countries and how it affects the overall health of the population. I like how you mentioned the city is set up to ride your bikes anywhere. I would love to ride my bike without the fear of getting sideswiped by a car!